Back in 2014, SanDisk became the first to offer a 128GB microSD card. The price? $199.99. Fast forward to today, and the same card with the same certifications (and a new coat of paint) is going for a paltry $24.87, just 12.4% of the original MSRP, on Amazon. That's pretty crazy to think about. This card carries Class 10 and U1 ratings, meaning that it has a minimum sequential writing speed of 10MB/s. That's not as good as U3's 30MB/s minimum speeds, but this thing is only $25. A comparable U3 SanDisk microSD for $25 will only get you 64GB of storage. Both of these cards support read speeds of up to 100MB/s. 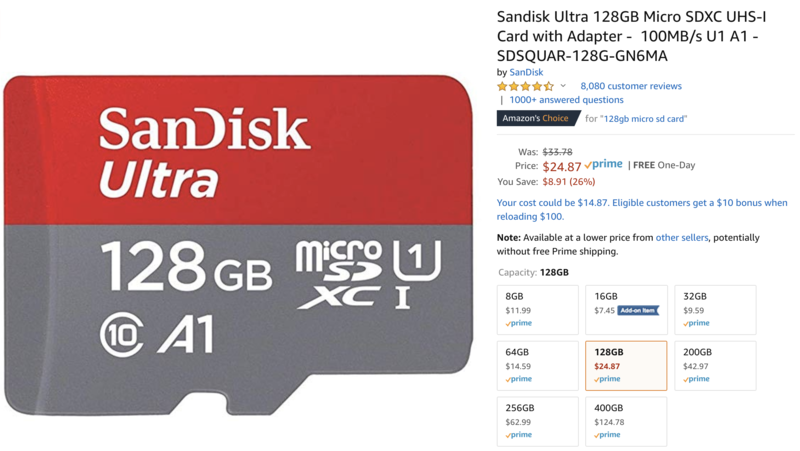 $24.87 is the lowest price we've seen on Amazon for this 128GB card. Expedited shipping is free with Prime. Hit the source link below to pick one up.